After a few coastal cruises or fishing trips, it’s not uncommon for the displays on a boat’s chartplotter, fish finder, radar or multi-function screen to end up covered with smudges, smears and fingerprints. And with manufacturers moving to touchscreen or hybrid touchscreen display technology, the need to keep screens clean will be even more important as boaters and fishermen routinely tap and drag their grimy digits across their boat’s numerous LCDs. So what is the best way to keep the screen on you electronics clean. Here’s what the GPS Store recommends. Just making sure you wash, rinse or at least wipe off your hands before reaching for that knob, button or touchscreen display can go a long way to keeping things from getting dirty in the first place. This is especially true for anglers who’ve been handling bait or unhooking fish — but any boater has the capacity to smudge up screens with skin oil, sunscreen or just dirt picked up from boat surfaces. Okay, we’ve all done it — grabbed the tail of our T-shirt, a used napkin from lunch or whatever happens to be handy to quickly wipe off anything from fingerprints to fish scales. Wiping a dry screen this way is a bad idea. Anything on the display — salt crystals, dust, scales — becomes an abrasive agent and can cause permanent scratching to the LCD surface. Considering that “handy” things are often already dirty and paper towels are made from wood pulp/fibers and are inherently abrasive, you can do more harm than good. You’ll find all sorts of “home remedies” for cleaning marine electronics displays — Windex, vinegar, furniture polish, metal polish (seriously). Chemicals and abrasives can remove the UV coating from your unit’s display and/or leave residue. 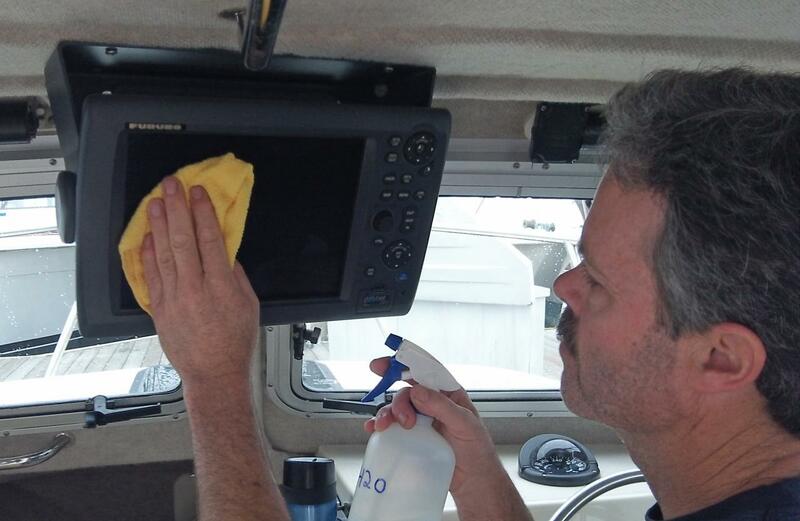 Several companies now make marine LCD cleaners designed especially for the job. One that The GPS Store carries is Electro Wipes by Baja Products (45 wipes plus buffing cloth sell for $9.95). Some electronics manufacturers offer their own branded cleaning solutions/products, and you can’t go wrong using them. If proper cleaning products aren’t available, clean, fresh water can be used to remove salt and grime before wiping. Use a fine-mist spray bottle or gently dribble bottled water over the display from the top. Use a soft, clean microfiber cloth to wipe clean. Turn your electronics off when cleaning the display. You’ll be able to see and remove all dirt and fingerprints better. In addition, heat from the displays can evaporate the cleaner before it can do its job. This is also a good reason not to clean your electronics in direct sunlight. Don’t press down too hard when wiping LCD displays off, as this can cause damage and increase the chance of scratching the screen if the cloth is dirty. Re-apply cleaner or use additional specialized wipes on stubborn smudges, rather than bearing down. Most electronics come with hard protective covers for storage — use them. If you clean your displays at the end of each trip, you’ll avoid letting dirt, oil or grime harden before the next trip. Pop the covers on after cleaning, and you can start your next trip with clean and clear displays. For more useful information about marine electronics products, how to use them and how to get the most from them, visit www.TheGPSStore.com.